Michael Novak's eyewitness report on the second and pivotal session of Vatican II in 1964 vividly inter weaves pageantry, politics, and theology. An unusually well-informed lay intellectual, who had earned a theological degree just before the Council, Novak applauded the purposes of Pope John XXIII and his successor Paul VI-"to throw open the windows of the church." In this report, he coined the classic description of the foes of the reforms at Vatican II as the party of "nonhistorical orthodoxy," emphasizing the eternal and unchanging, neglecting history and contingency. 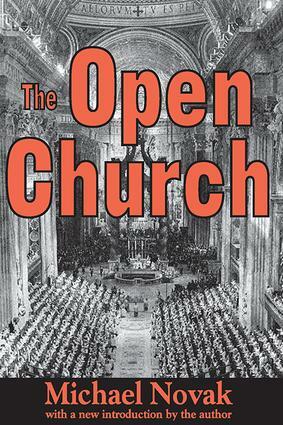 The author recounts many moments of high drama-Pope Paul VI's opening speech, the vote on the collegiality of bishops, the plea of Cardinal Bea on behalf of the chapter on Jews, and Bishop De Smedt's defense of religious freedom. His colorful chapter on the American bishops in 1964 serves as a fascinating benchmark, as do his many insights into the new role of the laity. His final chapter is a moving tribute to the Open Church engaging the contemporary world, and his new introduction brings this report up to date. This work will be of compelling interest to those interested in the post-conciliar fall of Communism, under the great John Paul II-who took his name from his two predecessors at Vatican II. The winner of the million-dollar Templeton Prize for Progress in Religion (1994), Michael Novak is a theologian, author, and former U.S. ambassador. He currently holds the George Frederick Jewett Chair in Religion and Public Policy at the American Enterprise Institute in Washington, D.C. where he is director of social and political studies. His writings have appeared in every major Western language, and in Chinese, Bengali, Korean, and Japanese. Also available from Transaction are his Catholic Social Thought and Liberal Institutions, The Experience of Nothingness, The Guns of Lattimer, Unmeltable Ethnics, Belief and Unbelief, and Choosing Presidents.